At the Humane Society thrift shop I found this Viking 6030 machine that was in parts. There was a plastic bag with all the pieces that someone in their intake shop had taken off the machine. The story I was told was that it didn’t run and they tried to fix it and decided to sell it for parts. 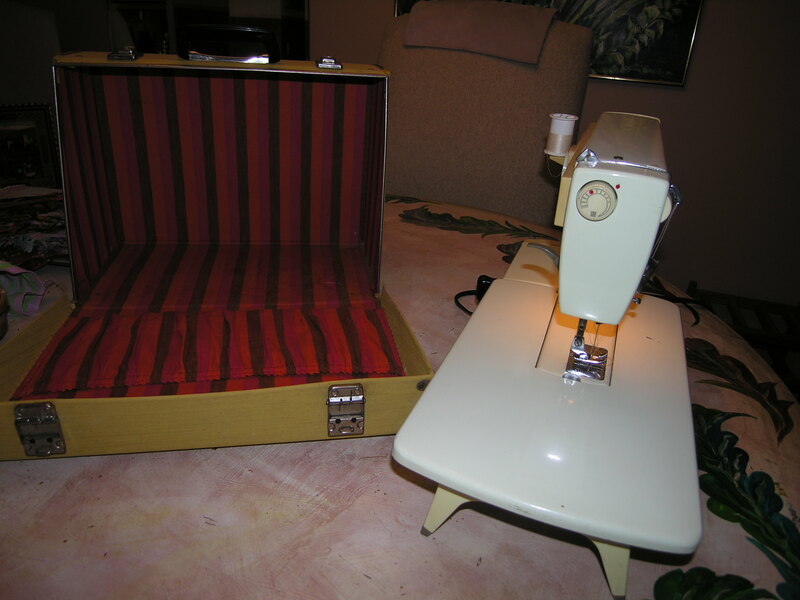 It was also very dirty, a slight cigarette smell…but it was only $5 and I knew that if I couldn’t get it back together and running that I could easily sell the carry case, foot control and extension table for a lot of cash on Ebay. Since I had rescued a similar machine I knew that the biggest problem with the older Vikings is oil and grease that solidifies in the gears. If you try to run them it will crack the cam shaft and then it will only do a straight and zig zag stitch. Sometimes they get stuck in reverse so someone will think there is a big problem. As soon as I got home, I covered the dining room table and spread out all the parts. They had taken apart the bobbin winding mechanism that is also the reduction gear and attaches to the belt that drives the hand wheel. I had nothing to look at or figure out where all the parts went. There was even a tiny little ball bearing the size of a pin head! I was so lucky they put all these parts in the bag and nothing was lost. After a few hours of putting it together and taking it apart just to put it back together a different way, I was ready to plug it in. The motor ran, the light worked and the controller gave it power. But none of the stitch dials moved and it ran hard. I quickly unplugged it and took the covers off so I could reach all the gears and drive bars. I liberally coated all of it with a silicone oil that melts the old grease. This morning, I put thread in the reassembled machine and crossed my fingers. It runs perfectly!! I wish I had taken photos of the machine in parts but I hope you can appreciate that this wonderful machine was headed for the dump and now it has a new life. 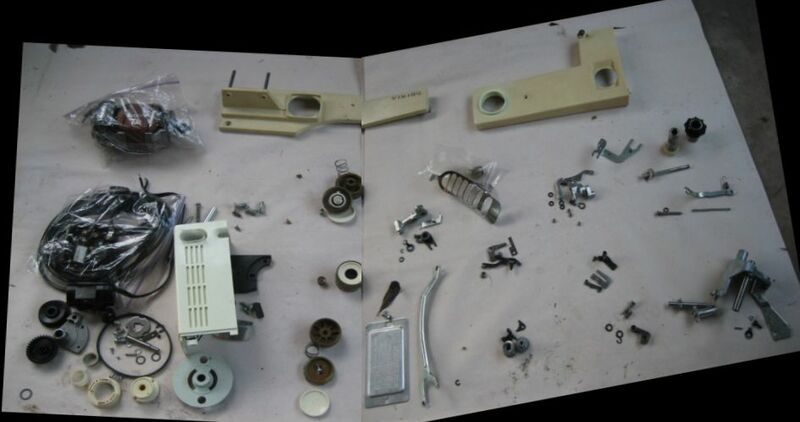 **** This is from another site but is basically what the parts looked like that I had to put back together. The guy who did this one at least knew where each part was supposed to go and didn’t have to do a hit or miss puzzle like I did. I too would have loved to see photos of your rescue in progress. Well done. WOW Janice I am full of admiration for you. Seeing those parts laid out like that puts the whole thing in perspective. A real 3D jigsaw puzzle. Bravo that mechanically minded woman. Janice, I also love tinkering with old machines that I usually find for a dollar to 5 dollars. 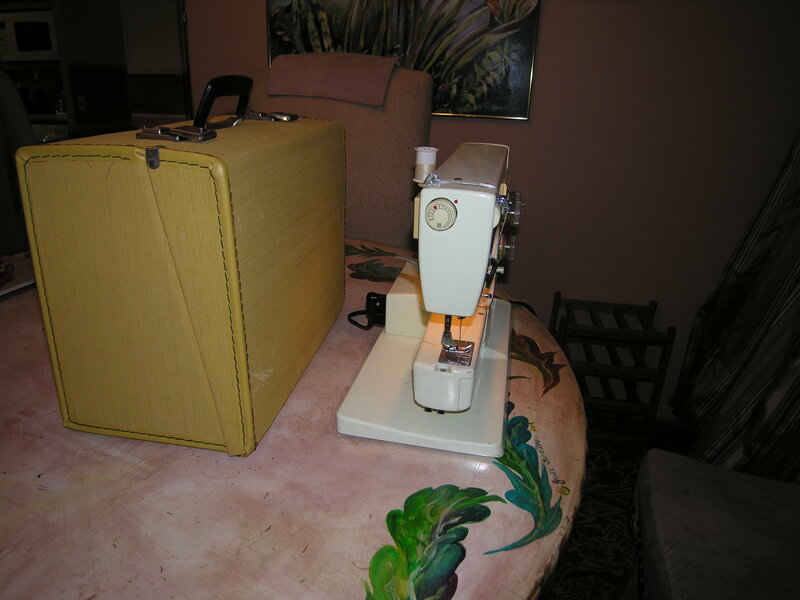 I have restored many and often give them to people who show an interest in learning to sew. My husband has a vintage Buick Apollo (1976), too! Keep up the good work! Hi Shirley. So you are like me and get hours of enjoyment from doing and figuring out the puzzle of what makes it work. 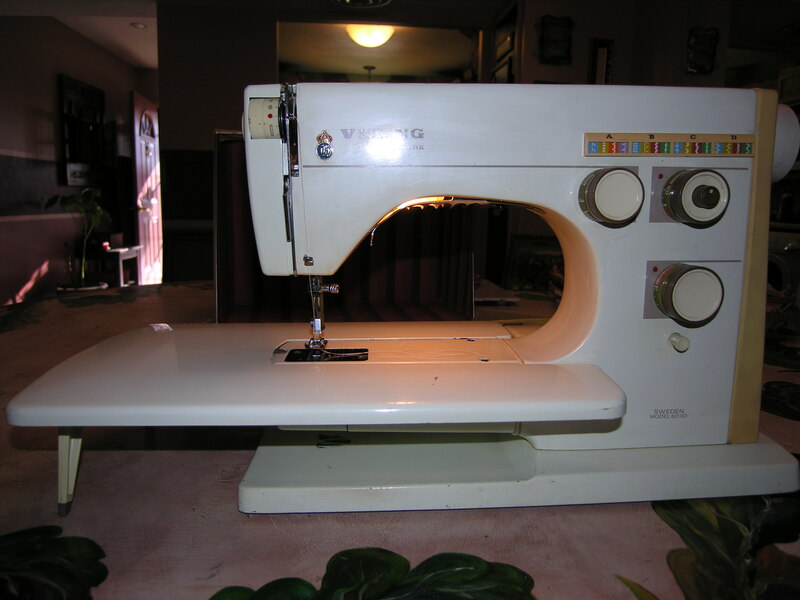 For anyone with an old Viking, the “Viking Sewing Machines pre-1980” group on Yahoo has a lot of excellent and somewhat hard to find information. The detailed manual, servicing information, model information (I learned my 1973-ish 5530 “special” is the school version of the 6030, just with one fixed cam stack. And parts are much easier to find for the 6030). Plus a lot of expertise from the couple who run the group. Hi I just bought a viking 6030 and it works beautifully, until I changed the cam to do different stitches and it is really squeaky from the cam area. Do you know why and can you help me?? Crossing my fingers tightly him hopes that you can.